Part Number: GLOWSEAT-EG Risk Reactor Inc.'s Elongated shaped yellow green Glow in the Dark Toilet Seat will make it easy for you to respond to natures call at night. During night time trips to the bathroom can be a dangerous adventure. Now with your new glowing toilet seat you can see what you are doing. Perfect for the young, the old, and everybody in between. The phosphorescent color charges from almost any light source in minutes then glows all night. In regular light the toilet seat will appear whitish and then glows in the glowing color at night. Our modern glow in the dark toilet seats appear to be just a bit of fun but this will offer you safety for the rest of your life time. Perfect for young and old alike. This handy bathroom tool went from a novelty to a life saver. When charged the seat can light up the entire bathroom. It takes the human 8 minutes to adjust to the darkness. When sleeping your eyes are already adjusted allowing you to see even the smallest amount of light. To prove this point take the glow seat charge it outside walk in closest. As you stare at it, it will appear to be glowing brighter but in actuality it is decreasing in glowing energy but your eye are adjusting to the dark. This phenomena allows our glow in the dark toilet seats to be bright for you all night. The soft light being emitted is perfect not to cause the light response in your eyes and brain offering you a better night sleep after a call of duty. I use it for myself and the kids, ours lights up enough to see in the hallway as well. This removes the need for any light, remove the costly plug in nightlights today and GO GREEN! We molded plastic to make strength and functionality our top concerns. The microbial additives and light fragrance makes it the only choice in bathroom decoration. The glow in the dark quality will last for more than 25 plus years. We use only the most advanced strontium aluminate pigment on earth to provide you the best in bathroom safety. Risk Reactor Inc. uses the most advanced technologies to create a toilet seat of the future. When closing the seat will impede the speed so that the cover closes smoothly and quietly. Risk Reactor Inc. toilet seats are very strong, light weight and flexible. 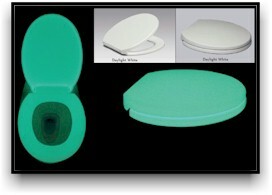 We specifically designed the glow in the dark toilet seat to install easy and quickly release. The quick release mechanism allows you to clean fast and thoroughly. Our super glow pigment makes the seat emit light for up to 12 hours after only charging for a few minutes. The soft glow at night will help you get back to sleep by not shocking your senses into being daylight. We engineered the plastic to be safe and hygienic lasting you years without batteries. Our glow in the dark seats will operate for your life time, never needing electricity. The perfect and best green energy product on the market. We add a soft fragrance to the plastic which removes the plastic smell and emit a nice atmosphere to do your business. Risk Reactor Inc. also added a powerful anti-microbial polymer which creates an ultra fresh, high level of protection against bacteria and micro-organisms.